There are many parents who are always worried about using the right ways that can help them in protecting their children from the viruses and the germs that they remain exposed to on a regular basis. Unfortunately, kids often get sick and this is something that is completely unavoidable. Kids are far more likely to fall sick very often because they have a very weak immune system. Slowly, with age, children start developing a strong immune system which helps them in fighting various diseases. However, there are some healthy habits that you can employ as a parent in order to give a good boost to your child’s immune system. 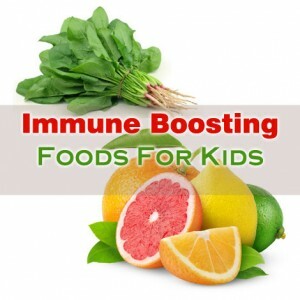 There are many immune boosting foods for kids, which you should include in your child’s diet. Citrus fruits are rich in their content of vitamin C which helps in slowing down the cell damage procedure and in speeding up the procedure of healing wounds. Vitamin C also protects a child’s body against various diseases. Another great food that is considered one of the best immune boosting foods for kids is yogurt. It contains certain useful germs known as probiotics that help in improving the way the human body makes use of food. Probiotics are also of good help in fighting sicknesses. Walnuts are rich in their content of healthy omega-3 fatty acids considered good for kids in a number of ways. According to experts, omega-3s help a child’s body in fighting illnesses of different types. They also help in cutting the chances of respiratory diseases in children. Spinach is another important vegetable that you should include in your child’s diet for boosting immunity. Spinach is very beneficial vegetable, which possess Vitamin C, beta-carotene, and lots of antioxidants. It helps in the infection fighting capacity of your child. Sweet potato is one of the important immune boosting foods for kids. Sweet potato is a good source of Vitamin C and Vitamin A. This is a great immune boosting vegetable, which works on mucus membranes that line-up the nose, and throat. Essential fatty acids are of good help in improving the immune system in children. Oily fish like salmon is not only good for improving a child’s brain development but even improves immunity in kids. EFAs help the white blood cells in fighting infections that help a child’s body in functioning properly. Black elderberries posses twice the natural antioxidants in blueberries and over 50% antioxidants in cranberries. Therefore, it can rightly be said that these are the best berries that can be used for boosting a child’s immune system.